As you can see, we’re testing major support here. The “street” is focused on these levels (because they are in this trade). 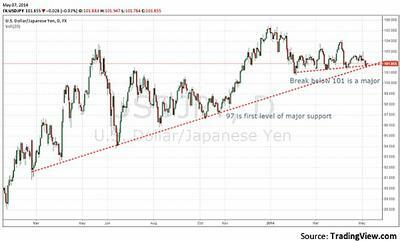 In my opinion, there’s a ton of bullish sentiment around the USDJPY, if it breaks ... a waterfall-like event could occur. Keep in mind, this is a big picture view and not designed for a short-term trade. If it breaks, I’m going to be selling at 101 (aggressively). Ideally, I’d be looking to cover at 97 and below. Of course, there’s an exit strategy if it doesn’t work my way. My stop level is 102.50. With that said, position sizing is critical. You have to be willing to absorb the blow (in your account) if 102.50 is reached. Binary option traders can look to buy put options on expirations that are a week to a month out. Bottom line, if this occurs it would mean the market is in a “risk-off” mode. In addition, I’m watching 10 year yields to move lower and the Nikkei as well. Keep an eye out on this one; there could be some fireworks if hedge funds start unwinding.